Let’s face it; if we’re going to cross land or water, we might as well do it in style. And not all bridges are simply constructions to get from one side to the other – many are iconic sights in their own right, with millions of people flocking to visit them every year. Here, we’ve picked our favourite architectural masterpieces from around the globe. 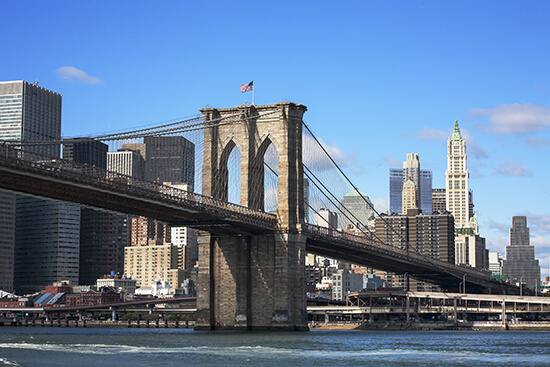 One of the most famous sights in New York City, Brooklyn Bridge dates back to the 1800s. Those rising Gothic towers, criss-crossing steel cables and double arches make walking or cycling across the bridge an unforgettable experience. Stretching across nearly 1,830m, around 100,000 cars cross the bridge every day. Whether you approach the converted warehouses of Brooklyn or the glittering Manhattan skyline, make sure you look up and admire the magnificent structure of the first roadway to connect Manhattan and Brooklyn. Easily one of the most iconic landmarks on the globe, the Sydney Harbour Bridge is the world’s largest steel arch bridge. Officially opening in 1932, it took 1,400 men eight years to build the structure, which is known among locals as the Coathanger. 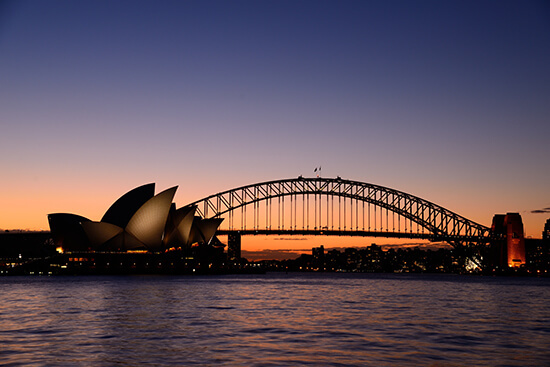 Today, it is the backdrop to one of the biggest New Year’s Eve firework displays in the world, and adrenaline junkies can even climb to the summit as part of the Sydney Harbour BridgeClimb; at the top, you’ll be rewarded with one of the best panoramas of the city. 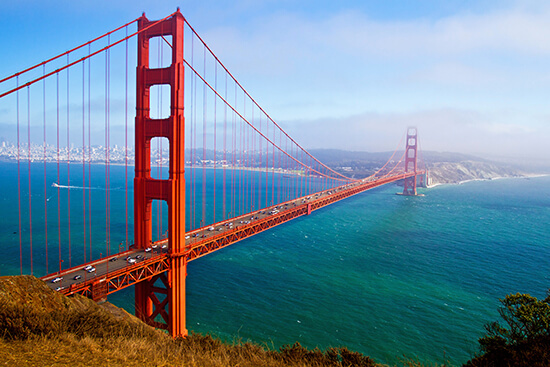 One of the seven wonders of the modern world and my personal favourite, the Golden Gate Bridge is a must-see. Spanning 1.7 miles from the strait of the Golden Gate to the Marin headlands, the single-suspension span is anchored by two towers which reach 227m into the air; once taller than any building in San Francisco. Since it opened in 1937, around 10,000 gallons of paint are used every year to keep the bridge looking its best. For one of the best ways to experience it, hire a bike and pedal over it via the waterfront. 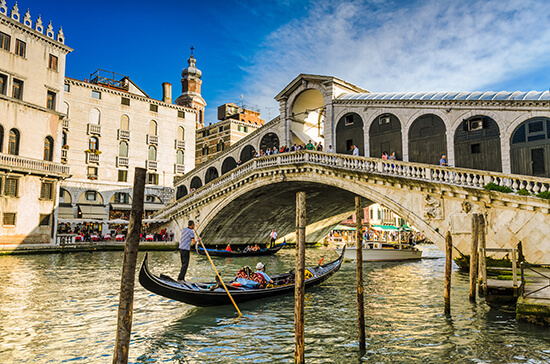 For nearly 300 years, this Venetian bridge was the only way to cross the Grand Canal on foot. Connecting the districts of San Polo and San Marco, this is the oldest of the four bridges spanning the canal and many famous artists submitted plans for it. Designer Antonio da Ponte was the lucky one who secured the bid, building the bridge out of marble. Today, it is one of the most visited tourist spots in the country. 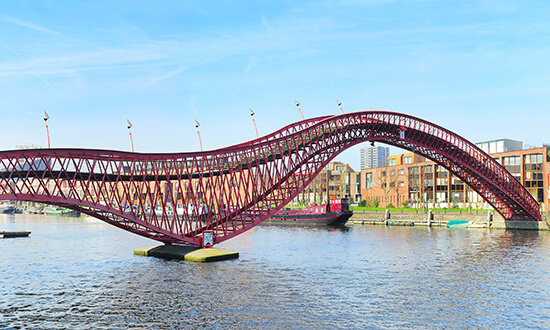 One of the most unusual structures in Europe, the red snake-like shape of Python Bridge connects Sporenburg with Borneo Island. It also clinched the International Footbridge Award in 2002, just a year after it was built. But be warned: crossing the bridge’s undulating walkway in adverse weather is not for the faint-hearted! 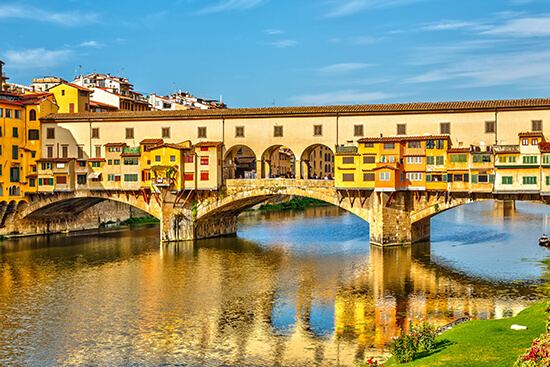 Florence’s oldest bridge spans the narrowest point of the Arno River and doesn’t really resemble a bridge at all, due to the numerous overhanging shops along it bursting with treasures. Dating back to 1345, floods nearly destroyed the bridge in 1966 and many of the shopowners were convinced the waters would sweep away their livelihoods, but it held and the glittering wares of the jewellers still entice shoppers from around the globe today. 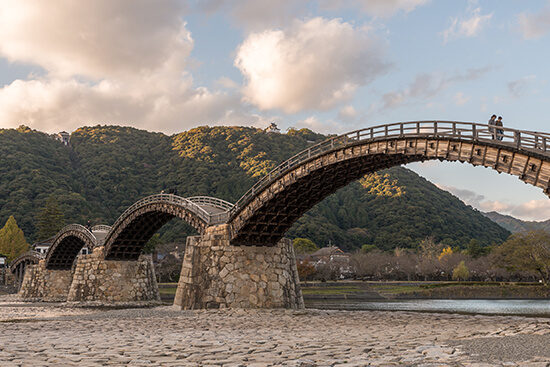 This historical wooden arch bridge, built in 1673, crosses the Nishiki River. It also boasts a magnificent setting at the foot of Mount Yokohama, which is topped by the famous Iwakuni Castle. Its series of five wooden arches inspired the name Kintai, which means gold brocade sash. Wondering when the best time to go is? Visit during cherry blossom season for a chance to see the bridge surrounded by beautiful pink flowering trees. The longest free span and curved bridge in the world, this futuristic structure can accommodate 250 people at once. Completed in 2004, it hangs an astonishing 701m above sea level, providing jaw-dropping views of the lush jungle. The structure is also suspended from an 82-metre-high single pylon, swinging out over the magnificent landscape below. Visit on an overcast day and you will literally be among the clouds. 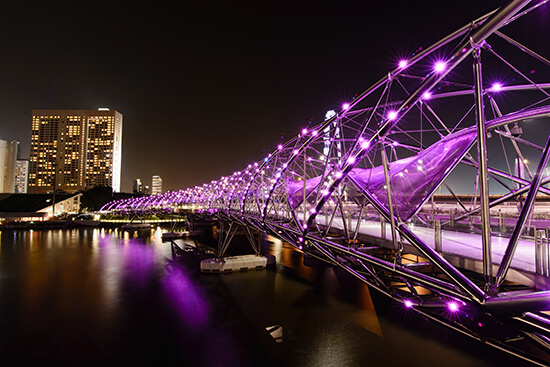 This remarkable piece of architecture at Singapore’s Marina Bay is the world’s first curved double-helix bridge, providing a direct connection between the Marina Centre and the Marina South. Inspired by the geometric arrangement of DNA, the walkway is encircled by opposing double helix structures of stainless steel. At night, the bridge is illuminated and four viewing pods extend out over the water, so you can experience a 360-degree view of the glittering skyline. Although a landslide in February resulted in parts of the Big Sur being inaccessible by car, this bridge still makes the cut. 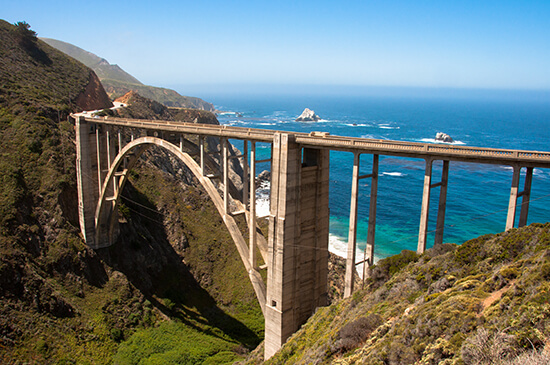 Located in California, Bixby Bridge is one of the most photographed in the world. You’ll also recognise it from numerous television series, including the recent American drama Big Little Lies. Pull over at various turnouts for amazing views. Ready to get exploring? Make an appointment with one of our Travel Experts to book your tailor-made holiday today.